As far as history goes, there was only one acceptable way for yesterday afternoon’s MLS Cup final to end. No disrespect to the New England Revolution, but only the Los Angeles Galaxy could have won that game. There was no way Landon Donovan, the greatest American soccer player of all time, could have gone out as anything other than MLS Cup champion. He had to go out on top. He had to help the Galaxy win their fifth MLS Cup, and a sixth cup for himself. Luckily, the universe, Robbie Keane and Gyasi Zardes (the first goal by a home grown MLS player) made it all happen, and the Galaxy were able to take home the 2-1 win. This was a pretty good, although at times sloppy, back and forth game. The two teams had a bit of a trepidacious and inconsistent first half, as they tried to feel each other out and see what kind of game each other was bringing to the pitch, but business picked up in the second half. Zardes got the scoring started, when he captured a Stefan Ishizaki cross while even with the left post, dribbled wide and struck past Bobby Shuttleworth into the right corner in the 52nd minute. Los Angeles dominated the next 25-30 minutes or so, and it looked like the trophy was all wrapped up. Almost out of nowhere, rookie Patrick Mullins made a deep run into the box on a ball from Jose Goncalves and kicked it back to Chris Tierney, who used the first touch to get by the defender and popped one past Jaime Penedo for the equalizer in the 79th minute. All of a sudden, the game was no longer comfortable for the Galaxy, and Donovan’s legacy MLS Cup win seemed in doubt. Keane puts home the winner. Neither team was able to score before the full 90 finished–although Teal Bunbury came oh so close when he looped one over Penedo and just off the cross bar in the 85th–and so we headed to the 30 minute extra time period. Nobody scored in the first 15 there either. It wasn’t until the 111th minute that the Galaxy finally broke through. Marcelo Sarvas sprung Keane, who had been named league MVP earlier in the week and was named the MVP of the final as well, with a beautiful long ball on the left side of the pitch. Keane wasted no time in erasing the memories of the sloppy game he was having, and finished beautifully with a strike to the right corner. 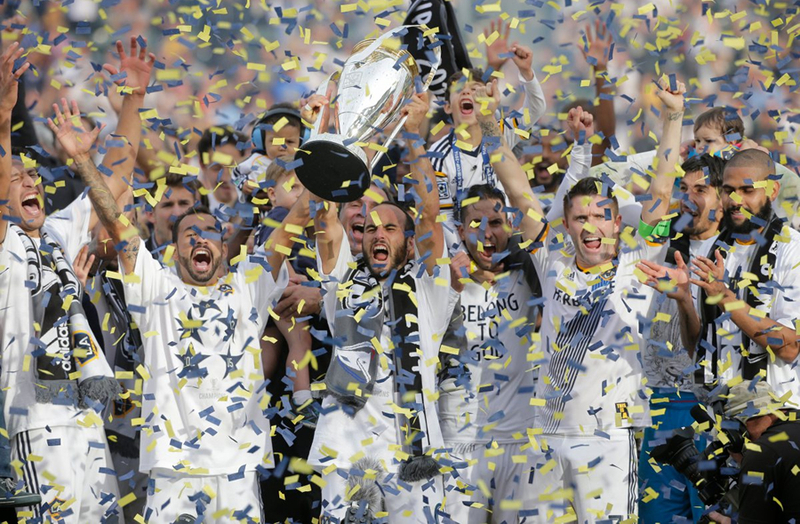 About ten minutes later, it was all over and the Galaxy had their fifth MLS Cup title. The real story here, despite the fact that he didn’t have the best of games, was Landon Donovan. As I mentioned earlier, this is Donovan’s sixth, and final, MLS Cup championship, having won it with the San Jose Earthquakes in 2001 and 2003, and the Galaxy in 2005, 2011, 2012 and now 2014 (he also lost a final with the Galaxy in 2009). It really is the only way he could have gone out. After he was robbed of a chance to represent the United States in a fourth World Cup this past July, it’s only fitting that he went out on top on the domestic side of things. Would he have helped the USMNT progress further in Brazil? I don’t know. But I do know that he helped the Galaxy cement their status as an MLS dynasty, and that’s good enough for me.